A mutualistic relationship is when two organisms of different species "work together," each benefiting from the relationship. 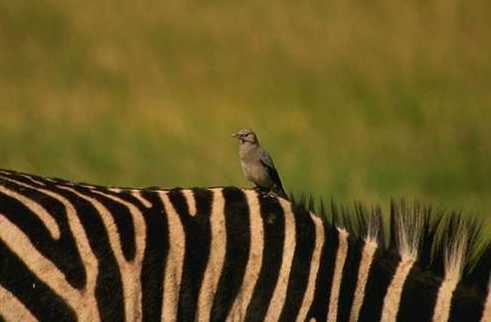 One example of a mutualistic relationship is that of the oxpecker (a kind of bird) and the rhinoceros or zebra. Oxpeckers land on rhinos or zebras and eat ticks and other parasites that live on their skin. The oxpeckers get food and the beasts get pest control. Also, when there is danger, the oxpeckers fly upward and scream a warning, which helps the symbiont (a name for the other partner in a relationship). Organisms in a mutualistic relationship evolved together. Each was part of the other's environment, so as they adapted to their environment, they "made use of" each other in a way that benefited both. 1. The bee and the flower. Bees fly from flower to flower gathering nectar, which they make into food, benefiting the bees. When they land in a flower, the bees get some pollen on their hairy bodies, and when they land in the next flower, some of the pollen from the first one rubs off, pollinating* the plant. This benefits the plants. In this mutualistic relationship, the bees get to eat, and the flowering plants get to reproduce. 3. The bacteria and the human. A certain kind of bacteria lives in the intestines of humans and many other animals. The human cannot digest all of the food that it eats. The bacteria eat the food that the human cannot digest and partially digest it, allowing the human to finish the job. The bacteria benefit by getting food, and the human benefits by being able to digest the food it eats. *Pollination is when the pollen from one flower gets into another flower, allowing the plants to reproduce. ** When one of the symbionts lives on or in the other, the one that is lived on or in is sometimes called the host. However, this term is usually used to describe parasitic relationships, rather than mutualistic ones.